A BCAA SUPPLEMENT BENEFITS EVERYONE! With so many benefits associated with BCAAs, it’s a logical choice for a must have supplement. Whether you are recovering cancer patient, aging athlete, busy Mom, recreational sports enthusiast, or Olympic athlete, you will benefit greatly by supplementing with our BCAA Powder. Gain Weight - Recovery equates to harder training tomorrow Improved protein synthesis translates to more muscle with less stress on your body. Not only does this equate to more muscle, it directly benefits the rest of your body. Think about how hard you train and the money and time you spend doing it. Maximizing every minute of your training and getting the most of every dollar you spend should be a primary goal. This is what we strive to provide for every consumer of every product we sell. More than just about any other supplement you’ll find at ProteinCo Canada, our BCAA Powder can help your body utilize calories and energy most efficiently leading to maximum return from everything you do. Power and Strength – Fast muscle growth! More muscle will increase strength and power. By facilitating protein synthesis while you train and compete, you are almost assured of building muscle faster giving you the strength and power you desire. Fitness – Less stress is good for your whole body By getting necessary and essential amino acids directly into your bloodstream, you bypass the digestion process. This takes tremendous stress off your body allowing you to recover quicker, have more energy and feel stronger. No matter what your training regimen consists of, or what your fitness goals are, you will be more likely to stick with an exercise routine if you have more energy and see the results from your efforts. Our BCAA Powder will keep you energized and motivated to stay active and fit. Lose Fat – Calorie free energy return Wouldn’t it be nice if our bodies just stopped absorbing calories once we had all we needed for the day? While that’s a dream that most likely won’t ever come true, BCAAs just might be the next best thing. Our BCAA amino acid blend is virtually calorie free food and energy. This doesn’t mean we advocate massive consumption to lose weight. It can be an effective form of energy to help you get through your workout, without you needing to consume other products that contain calories to produce energy. This can be an effective tool in your weight lose arsenal. Energy – Direct to your bloodstream Because BCAAs bypass the liver and go directly into your bloodstream, it’s almost instantaneously available energy. Taken 10 -15 minutes before your workout, it can give you that boost you need to get in the gym and complete that workout! Active Lifestyle – A supplement to keep you feeling young and energetic It’s much easier to remain active when you feel good. So many things can get in the way of overall good health robbing you of the energy you need to live an active lifestyle. Branched chain amino acids show promise fighting diabetes by aiding in glucose metabolism. They can assist with maintaining muscle mass as you age and alleviate muscle pain and soreness post workout by reducing muscular inflammation. Recent research suggests they can extend life and combat age-promoting cellular destruction, possibly through their ability to facilitate mitochondrial regeneration. Packing 10 grams of BCAAs per serving in a powdered drink mix that has added flavor to taste great. The amount of amino acids per serving is ideal for heavy weight lifters and body builders. It lends itself to adding to other workout drinks be it before, during, after or spread out through the day. Branched Chained Amino Acids (BCAA) are a must have supplement for bodybuilders and anyone looking to add quality and quantity to their other protein sources. ProteinCo’s BCAA Powder provides 10 g per serving of three essential amino acids, Leucine, Valine and Isoleucine. Of the approximately 40% of your body weight that is muscle, one fifth is comprised of leucine, isoleucine, and valine. Essential amino acids are those which your body cannot make and must therefore be consumed through external sources. BCAAs comprise three out of nine essential amino acids. Everyone needs more amino acids than what foods provide throughout their lives for various reasons. The ProteinCo’s BCAA powder provides you with trusted purity and ease of use to meet those needs. PURE BRANCHED CHAINED AMINO ACIDS! Keeping your nitrogen balance in the positive In order to build or maintain muscle, your body needs to be in a certain state to promote growth. Consuming adequate amounts of protein, compensating for the stresses you put your body under, assures you build muscle and don’t lose it. BCAAs are sometimes referred to as the building blocks of muscle protein. When ingested, they go directly into your bloodstream with the aid of enzymes for metabolism and transport. This means they are absorbed into your muscles directly and quickly. Many athletes and others who have reason to experience muscle fatigue are deficient in BCAA levels. Taking a BCAA supplement will assure you keep adequate quantities in your body at all times, especially during your hard training days. Overall fatigue will be reduced due to having amino acids you can use without having to breakdown food to do it. Digesting is hard work too! GET EXTRA PROTEIN WITHOUT EATING MORE! Amino acids can be used to build new muscle proteins and can also be burned as an energy producing fuel. Most people don’t equate protein directly to amino acids. In reality, if you supplemented with the proper amount and ratios of amino acids, you’d never have to eat protein, assuming you have the required enzymes for metabolism. We don’t choose this route primarily for taste and expense reasons. Your body processes amino acids from the protein you eat much more economically at this point. Plus we are carnivores by nature so most of us want a tasty steak, chicken breast or fish fillet on occasion. Protein from animals, plants AND supplements The downside to eating animal protein is the burn process to extract those amino acids is hard on your body and gives off unwanted exhaust fumes. In other words, meat is a positive return amino acid wise but it burns dirty which robs you of energy. Whole, raw plant foods contain all the essential amino acids either alone or in combination with a variety of sources. The burn process is clean but the return isn’t as high as animal based protein. We encourage variety in the types of protein consumed throughout the day. Therefore, it’s advantageous to get at least some amino acids during the day through supplements. ProteinCo’s BCCA Powder is processed to eliminate the fatigue of digestion and they contain virtually no calories! Why more leucine in the ratio? Leucine is widely considered a more important amino acid of the three. The BCAA leucine is the only amino acid that helps stimulate muscle cell DNA, increasing muscle protein synthesis. This is why you find twice as much Leucine in our BCAA Powder compared to Isoleucine and Valine. Mitichondria fuel and regeneration The body’s mitochondria are the source of over 90% of all energetic output in the human body. They are cellular powerhouses – mini furnaces – that take the fuel you provide them to give back energy to you and your body. BCAAs that get absorbed directly into the muscle in turn fuel your mitochondria increasing your energy output. In addition, recent studies have indicated branched chained amino acids may contribute to increased concentrations of mitochondria in your cells. The more furnaces you have burning, is directly related to more power output from your body when you demand it. Q – What makes your BCAA supplement better than others? A Purity! We go to great lengths to assure our products a free from harmful toxins and other ingredients you don’t want or pay for. Especially with amino acids that go directly into your bloodstream, you MUST have an absolutely pure product. Q – Can it help me lose excess body fat used as a weight loss supplement? A It can assist you with losing body fat however, it’s shouldn’t be looked at as a weight loss supplement. In truth, we don’t feel like there is any such thing as a cure all product. Yes, BCAA consumption can assist with weight loss as it is food and energy with virtually zero calories. Yes, it can assist with burning more fat by building more muscle and increasing your metabolism. Using our BCAA Powder to enhance and assist with everything else you do will make your fat loss efforts real and lasting. POSITIVE NITROGEN BALANCE CAN MEAN MORE MUSCLE AND LESS FATIGUE! Q – How do I build muscle without gaining weight eating so much protein?A – Remember that muscle weighs more than fat. Building muscle will most likely result in replacing at least some of your body fat with muscle mass. Scale weight will fluctuate and possibly increase as you become more “fit”. Consuming high amounts of calories to maintain that muscle building state is an understandable concern. Again, BCAA Powder is protein and energy void of calories so it should assist you with this concern taken as a regular “supplement” to other protein sources. 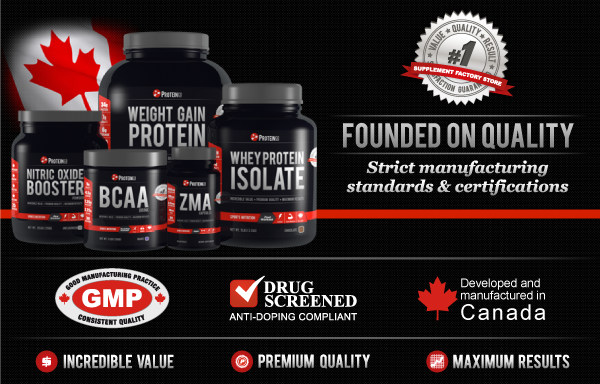 Premium Quality - Strict manufacturing standards and certifications: As with all ProteinCo supplements, our BCAA Powder is manufactured under strict cGMP procedures to ensure the quality you deserve. You get the highest quality amino acids free of impurities. This translates to peace of mind for you no matter what your reason is for wanting pure, healthy supplements. Maximum Results – Working alone and in concert with EVERY product To reiterate, BCAAs are a fast acting muscle protein synthesizer that enhances the results you see from every other nutrient and supplement your body processes. What more can a product do to facilitate maximum results regardless of you end goal? Simply put, you need to supplement with this product if you are serious about your training. Personalizing This is an excellent product for adding to any other drink mix you consume. It allows you to get more protein without adding additional calories. Any portion of a serving can be added to dial in your needs precisely. BEFORE – Pre Workout Taken before workouts, BCCAs can boost you energy levels to take your intensity level up a notch. Keeping your system in nitrogen balance so you build muscle from your workouts is key. Pre-exercise consumption is one of the most important times to assure your body is ready to get the most out of your efforts. DURING Training Athletes have reported positive results consuming BCAA supplement during heavy weight lifting sessions in particular. Experiment by getting some additional amino acids into your system during your workouts to see if you notice an improvement. AFTER – Post Workout Following training and competition can be another great time to realize the benefits of BCAAs. We suggest you experiment with the timing that seems to work best for you. More is not necessarily better so don’t overdo it. Select one of two key times of day to experiment with your intake and stick with that for 2-4 weeks at least. If you desire to change and experiment, stick with your new routine for about a month as well so you have enough time to compare the real differences.